When comparing religious/traditional values with secular/non-traditional values, Sweden always comes out of research as amongst the most secular, non-traditional countries in the world. The low voting frequency in the recent Church elections reflects this. Basically, many people in Sweden don’t want religion to have anything to do with politics and Sweden is one of the few countries in the world that has separated religion and politics from each other. This is clearly shown in the latest outrage to appear on social media in Sweden – the appointment of the new Employment Minister, Elisabeth Svantesson. 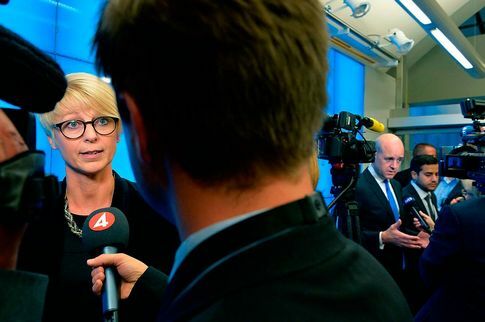 Ms Svantesson comes from the Swedish Conservative Party – the Moderates – and has recently been given this high profile position in the Cabinet. Where this becomes interesting is what is causing the outrage. It seems that Ms Svantesson holds a religious belief and belongs to a radical Christian organisation which, amongst other things, condemns abortion and homosexuality. Voices have been risen for her immediate resignation. This is so different from most other countries around the world. Take a country like the USA -nobody gets to become President there without mentioning God. Many countries are theocracies, where the political leaders and the religious leaders are the same. In most other countries, believing in a religious deity is an advantage, if not a necessity, for a public figure to be taken seriously. But in Sweden, believing in a God is a rarely an advantage for a public figure. They are often ridiculed and their credibility is challenged by the general public and the press. And this makes me think…..just when did religion become a liability in Sweden? Sweden’s Easter tree – wiping, witching or whipping? Yuo know you've been in Sweden too long when..